In September 2017, Joy and I visited a good friend in Munich, Germany. While there, we explored what is left of the concentration camp at Dachau. Nothing could have prepared me for what I saw and felt. Visitors to Dachau are very quiet. It's a horrible and holy place. The weight of the evil is still there. You can still feel it. I think it will always be palpable. It should be. I left Dachau needing to express my own grief. This painting is that expression. 1) Featured on the far left of this piece is the iron gate with the words "Arbeit Macht Frei" (Work Makes you Free). This gate was the way in, but rarely the way out. 2) Moving to the right, set against and gray and blue stripes reminiscent of the uniform prisoners were given to wear is the gold star of David, beneath which are the countless souls who suffered here. 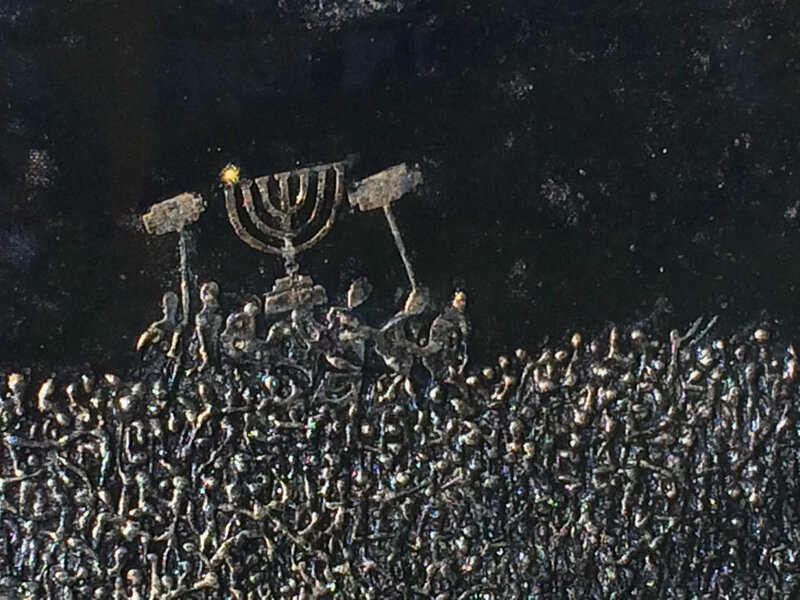 3) Moving to the far right, I inserted a scene from the Arch of Titus in Rome, featuring Roman soldiers carrying off the menorah from the temple in Jerusalem (another time of absolute grief and horror). It is at this point, against the blackness, I inserted a symbol of hope. Hope is displayed near the far right of the canvas, carrying the eye off the artwork...onto...what? That is what hope does -- carries our imagination into the unknown, with the assumption that goodness and beauty and life is coming soon. Well here it is. Done. After just over 13 months, it's now hanging on my wall, and it's hard for me to get used to. It's actually shocking every time I pass by. "OMG! Okay yes, there you are!" It's like someone belting out a strain from a Wagnerian opera every time you walk by it (it's very hard to ignore). I learned a whole lot from this project. I hadn't really don't much with the "waterfall theme" before, but now that I've gotten my feet wet so to speak (pardon the pun), I've got two other waterfall paintings nearly done (though much smaller in scale). No other painting has been so challenging and really, no other has given me so much joy in it's creation. Fetched back from its thickening shroud of gray. Idea to you of a real love-rhyme? With long bared arms. There the glass still is. And the glass we used, and the cascade's rhyme. The hanging plants that were bathing there. Persistently sung by the fall above. I have been waiting for this resin pour for over a year now. This painting, my depiction of Cullasaja Falls, (pronounced Kull-uh-say-ja) was begun a year ago now, and at 6' x 8', it is the largest single panel painting I've ever done. It also is the most detailed piece I've worked on. Over this past year, I've had multiple visitors to my River Arts District art studio ask "Oh, when are you finishing THAT one!?" My answer has usually been "I have no idea. I'll just keep working on it until it says it's done". My first post about this piece was back on July 18th of last year. That post shows where this all started (a blank wood panel). A month later, my panel was prepped and I was beginning to apply my texture sketch. By November, my texture was applied and I was ready to seal the painting, preparing it for the application of the aluminum leaf. Eleven months later, I was in the "home stretch, starting to see the light at the end of the tunnel. It's been really nice working on the painting this way. My original idea was that it would probably take six months to complete. Considering the fact that the rest of my oil paintings take about a month, I thought I was being generous with my six month time schedule. But six months came and went, uh, six months ago and I didn't care. The goal I had was to produce something that would (at least for this day in 2017) represent the very best I could possibly do, and to do that took a lot of time. Well this painting is done now and last night, I poured the resin. And this time, rather than achieving a thick glassy smooth surface, I wanted to apply just one layer of resin. This left a lot of the texture quite visible. I spent weeks and weeks of texture application and didn't want to cover it all up, and with just one layer, the painting will sparkle. Today (Tuesday) is my day off (THANK YOU RUTH VANN FOR WATCHING MY STUDIO ON TUESDAYS!) and I'm making myself wait until tomorrow morning to go in and inspect the piece. As long as I didn't have any gnats or flies dive-bombing into the resin while it was still curing, I'll be fine. And tomorrow is party time! By the end of the day, the largest painting I've ever painted will be hanging on my studio wall! About a month ago ago, I was asked to work on a commission. They requested an abstract painting based on the general idea of some other abstracts I've done in the past but they (very helpfully) requested I use the colors in Degas' "The Green Dancer" (shown below). The reason I loved this assignment was, well, there were two reasons...First, I didn't have to search for colors that would work and second, it was so much fun color matching one of Degas' most famous pieces. So my River Arts District art studio has been full of this really large painting now for about a month. It is scheduled to get its first layer of resin in the next couple of days (as soon as I get the gold leaf on the edges), and then it ships to Chicago. Honestly, I am going to miss looking at this one. I named this piece "Glacial Fractures" because it when I stand back and ask what it wanted to be called, the night time image of towering glaciers in Antarctica came to mind. Of course, the glaciers are lit from within (probably due to the aliens trapped in the ice). Ha ha. Don't you go rolling your eyes at me. I'm an X-Files geek. I can't help myself. The thing I really enjoy about a abstract wall art is that it feels as though I have very little control over the thing. It really does feel like it has a mind of it's own. This piece (above) is a studio photo of what is the largest abstract oil painting I've done. I was given several photos of the room in which it will eventually hang, and then my task was to design an abstract painting that complimented that space and would be a real statement piece. So I had an idea of the colors I was going to use, but that's all. As I began several weeks ago, I felt like I had some good "movement" going on with the texture I applied. When that texture was done and covered with metallic leaf, then I began the actual paint application, and that's when the fun starts. I just almost randomly chose the first color and a large paint brush and dove right in. What I've learned is that I really need to apply one color at a time to my paintings and let those colors dry before I apply the next layer. This takes days and days, but slowly the piece begins developing into something interesting. Then, it's a matter of looking critically at the piece and determine what is "growing" that you want to develop and accentuate, and what might need to be minimized (visual dead ends). It's kind of like working in a garden -- mulching the plants and pulling the weeds until everything you want growing is mature and beautiful and everything that should not be there is gone. This painting is headed out to it's new home in Knoxville, TN in a couple weeks (after it gets the resin application). Last August, I was hiking with my wife Joy around the mountains of western North Carolina and my mind was relaxing. I could feel it. And when that happens, when my soul "breathes deeply"...that is when I come up with crazy ideas. I can't help it. I'm convinced Joy was brought into my life to consistently bring me back to reality when I start a conversation with "Hey, I have an idea!" But this time, she just listened and said, "I think you should try it." The idea I had shared was to create the largest painting I've ever done by far. Most of my paintings take about one month to complete. What my mind was questioning whilst hiking that day was "what would a six month painting even look like?" I had no idea. Hmmm. I still have no idea. This baby is going on nine months now, but it is 90% complete thanks to yesterday. See, yesterday was the last day of studio stroll and it was pouring rain most of the day which was perfect weather to get going on the final stretch of my "big mamma" painting, since no one was exploring the River Arts District in such horrid weather. And because I needed to be there all day, I painted through the downpours and now I'm nearly done. "Is this a commission?" people ask. "No," I explain. "This is the most impractical art related idea I've ever had." But I had to do it. I am so incredibly thankful that my wife Joy blew on the spark and didn't douse it. Will this ever sell? Is it actually worth the time and effort I put into it? I have no idea and for this one, it doesn't matter. I want this to be the absolute best oil painting I am capable of creating to date. That is what it is for. Most of what I do is for very practical reasons, but now and then, I am convinced people need to be okay with doing something simply and only for the joy of doing it. This monster painting is giving me great joy. And when I complete it and it's hanging on the wall in my studio, I will have a party and celebrate. And you'll be invited. I love working large. Large artwork is commanding. Whether it’s intended as entrance art to grab you as soon as you enter a house or just a large wall piece, a sizable painting is artwork on a grand scale. I am currently working on a large commissioned art project for some nice folks in Austin, TX. The composition is triptych, and is based on a scene of the Rocky mountains -- mountains and birch trees reflecting in a lake. I just finished applying the metallic leaf to the textured surfaces of the panels yesterday and I was ready to go home -- turned off the lights and went to the back of the studio to get my keys, and when I turned around, I saw the panels reflecting back the late afternoon sunlight and I had to get a photo. Sorry. I get excited about stuff like this. One day, I'll have to just do a painting with no paint at all -- just metal covered with resin. I think that would be cool. Anyway, this one is ready for paint now, and by the end of the day, I'll have that first layer of paint applied. Sometimes, when I get into a piece, it's cool to explore the background story. This scene from Glacier National Park required just a bit of research so that I'm not just painting a painting, but I'm depicting a place. I want to capture the "spirit" of that place. Throughout time, people have sought out Glacier National Park's rugged peaks, clear waters, and glacial-carved valleys; its landscape giving both desired resources and inspiration to those persistent enough to venture through it. Evidence of human use in this area dates back to over 10,000 years. By the time the first European explorers came into this region, several different tribes inhabited the area. The Blackfeet Indians controlled the vast prairies east of the mountains, while the Salish and Kootenai Indians lived in the western valleys, traveling over the mountains in search of game and to hunt the great herds of buffalo on the eastern plains. The majority of early European explorers came to this area in search of beaver and other pelts. They were soon followed by miners and, eventually, settlers looking for land. By 1891, the completion of the Great Northern Railway sealed the area’s fate, allowing a greater number of people to enter into the heart of northwest Montana. Homesteaders settled in the valleys west of Marias Pass and soon small towns developed. Around the turn of the century, people started to look at the land differently. For some, this place held more than minerals to mine or land to farm…they began to recognize that the area had a unique scenic beauty all to its own. By the late 1800s, influential leaders like George Bird Grinnell, pushed for the creation of a national park. In 1910, Grinnell and others saw their efforts rewarded when President Taft signed the bill establishing Glacier as the country's 10th national park. "Moonlight Sonata" was a bit of an experiment in that I don't usually paint a "moonlit" scene, mostly because I don't want the overall tone is too dark (simply because for my paintings to work, I need light being able to reflect off the aluminum leaf background and back through the paint I've applied. So for this painting to work, I had to play with the darkness of the color, the thickness of the paint, and the judicious placement of white paint (the most opaque paint I use). The result honestly is what I saw in my head, so I'm really happy with the piece. Three cheers for experimentation!